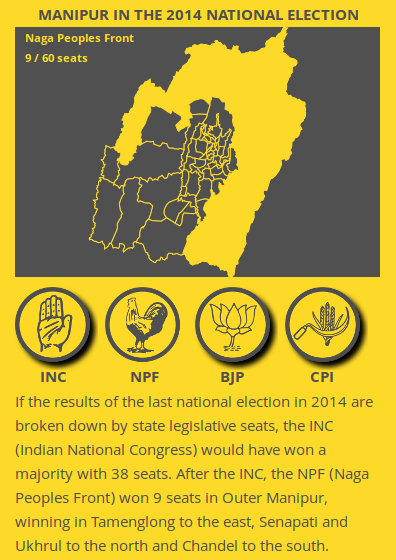 So I created an interactive for Wionews.com (embedded below) on the assembly elections taking place in five states. This write-up goes into how I did the interactive and the motivations behind it. The Interactive is embedded below. Click on Start to begin. 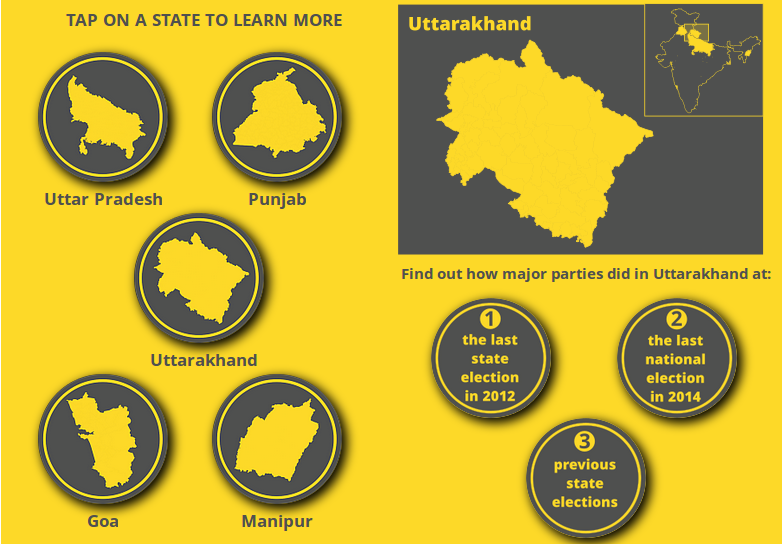 where each party won in the last assembly election in 2012 in each of the five states, visualised with a map. where each party won in the last Lok Sabha (LS) election in 2014, if the LS seats were broken up into assembly seats. This was also done with a map. the share of seats won by each major party in previous assembly elections, done with a line chart. I got all my data from the Election commission website and the Datameet repositories, specifically the repositories with the assembly constituency shapefiles and historical assembly election results. Now these files have a lot of information in them, but since I was making this interactive specifically for mobile screens and there wouldn’t be much space to play with, I made a decision to focus just on which party won where. As mundane as that may seem, there’s still some interesting things you get to see. 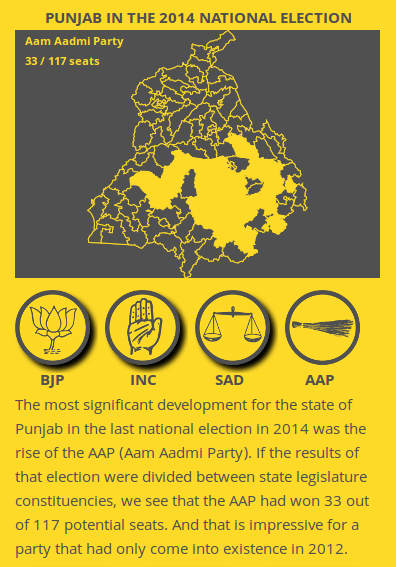 For example, from the break-up of the 2014 Lok Sabha results, you find out where the Aam Aadmi Party has gained influence in Punjab since the last assembly elections in 2012, when they weren’t around. While I got the 2012 election results directly from the election commission’s files, the breakdown of the 2014 Lok Sabha results by assembly seat needed a little more work with some data analysis in python (see code below) and manual cross-checking with other election commission files. Some of the python code used to break down the 2014 LS results by assembly seat. You can see all of it here. For calculating the percentages of seats won by major parties in the past, I had to do some analysis in python of Datameet’s assembly election results file. 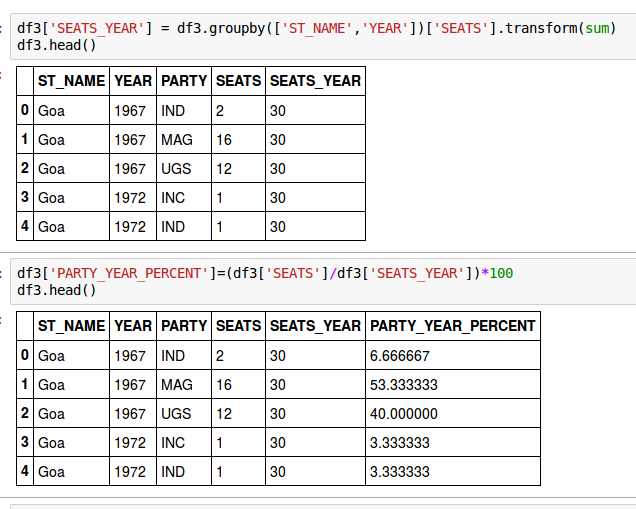 Some of the python code used to calculate historical seat shares of parties. You can see all of it here. The next thing to do was put the data of which party won where onto an assembly seat map for each state. 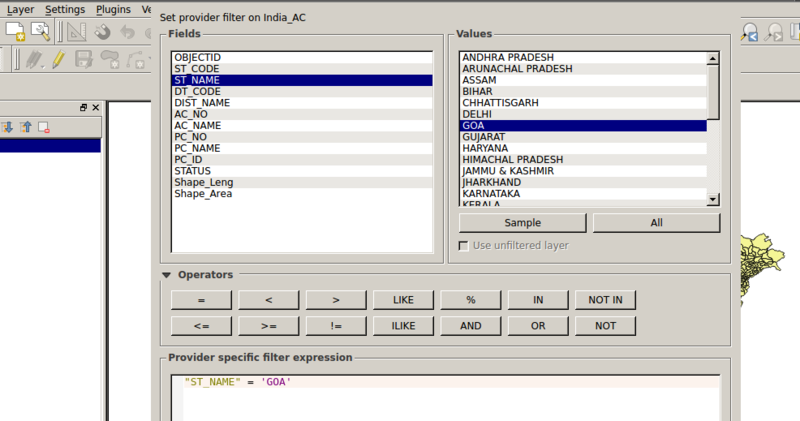 A screenshot of the QGIS software separating the India shapefile into separate ones for the states. The next task is to make sure the assembly constituency names in the shapefiles match the constituency names in the election results. For example, in the shapefile, one constituency in Uttar Pradesh is spelt as Bishwavnathganj while in the election results, it’s spelt as Vishwanathganj. These spellings need to be made consistent for the map to work properly. I did this with the OpenRefine software which has a lot of inbuilt tools to detect and correct these kinds of inconsistencies. 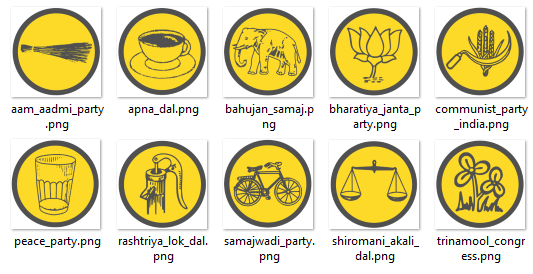 I then chose the biggest three or four political parties in the 2012 assembly and 2014 LS election results for each state, and created icons for them using the tool Inkscape. This can be done by tracing the party symbols available in various election commission documents. The way the interactive would work is if you click on the icon for a party, it downloads the geojson file which, to crudely put it, has the boundaries of the assembly seats and the names of the party that’s won each seat. I won’t go into the nitty gritty of how the line chart works, but essentially every time you click on one of these icons, it changes the opacity of the line representing the party into 1 making it visible while the opacity of every other line is reduced to 0 making them invisible. 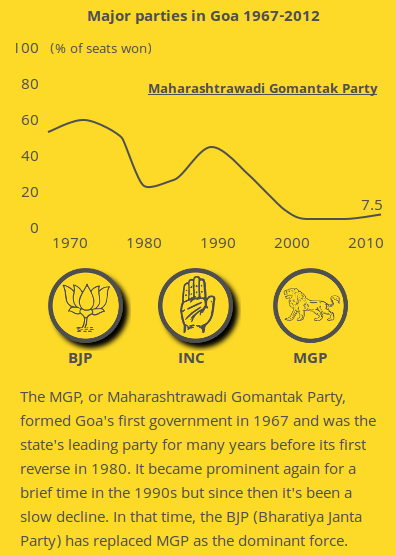 The historical performance of the MGP in Goa. I then put everything into a repository on Github and used Github pages to ‘serve’ the interactive to users. Now I haven’t gone into the complexity of much of what’s been done. For example, if you see those party symbols and the tiny little shadows under them (they’re called drop shadows), it took me at least two days to make that happen. It took two days to get these drop shadows! As for the design, I wanted something that people would just click/swipe through, that they wouldn’t have to scroll through, and also limit the data on display, giving only as much as someone can absorb at a glance. My larger goal was to try and start doing data journalism that’s friendlier and more approachable than the stuff I’ve been doing in the past such as this blogpost on the Jharkhand elections. I actually read a lot on user interface design, after which I made sure that the icons people tap on their screen are large enough for their thumbs, that icons were placed in the lower half of the screen so that their thumbs wouldn’t have to travel as much to tap on them, and adopted flat design with just a few drop shadows and not too many what-are-called skeumorphic effects. Another goal was to allow readers to get to the information they’re most interested in without having to wade through paras of text by just tapping on various options. I hacked a lot of D3.js examples on bl.ocks.org and stackoverflow.com to arrive at the final interactive, I’m still some way away from writing d3 code from scratch, but I hope to get there soon. Shijith Kunhitty is a data journalist at WION and former deputy editor of IndiaSpend. He is an alumnus of Washington University, St. Louis and Hindu College, Delhi.